PhytoChemia is proud to present the cannabinoids family (in the convenient form of a poster that you can put on your wall). This magnificient work of art was made in collaboration with Marianne Parent from Pixel M Design. 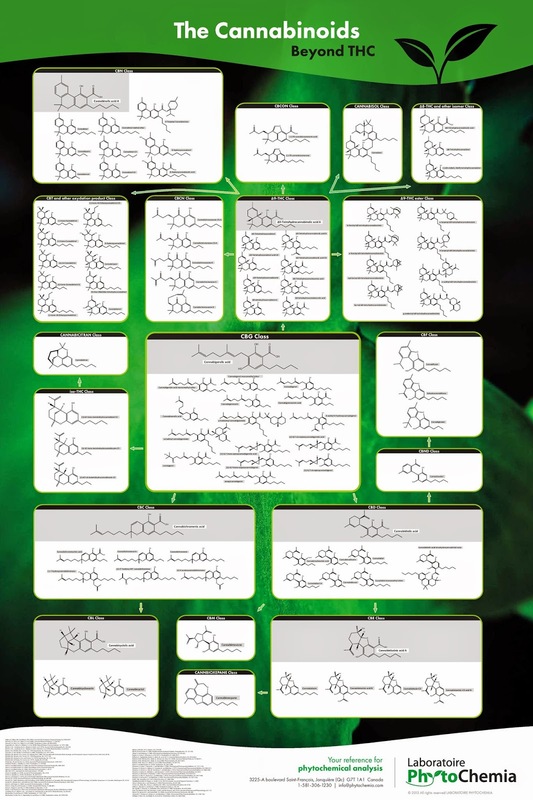 This poster is a curated list of the structures of all known cannabinoids with their suspected precursor (some pathways are proven other are suspected). It is a great demonstration of the complexity that we encounter when we are working with phytochemicals. A lot of those compounds have a pharmacological effects, but this subject is better treated on its own. If you wish to have a high quality printed versions please let us know, the price should be around 45$CAD + taxes (~38$USD) (no taxes if you're outside of the country), possibly less if we have a lot of demand. You can click here to see a bigger version of the image. Edit: A typo (oxydation->oxidation) was spotted by /u/Alex4921 on reddit. It will be corrected in the printed version. A very interesting, informative and attractive presentation.